Your kind purchases help keep this show running. But if you want a more direct way to support the show, make a donation or become a Patron of the Podcast. Listen to the Irish & Celtic Music Podcast on your phone with this fun and easy-to-use iPhone or Android mobile app from Libsyn, my podcast host. If you're a fan of Marc Gunn's Music, then you might also enjoy my Celtic Music app, exclusively available through Android phones. Download your Android app from Amazon. Show your love of my podcast with one of these fun bumper 8.5"x2.75" bumper stickers. 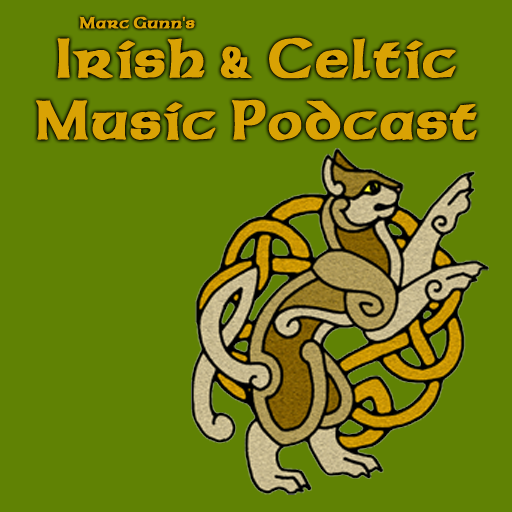 Irish & Celtic Music Podcast celebrates Celtic culture through music. Get a free digital copy of Marc Gunn's album How America Saved Irish Music with your purchase! Show your love of my podcast with one of these fun 4" diameter stickers. 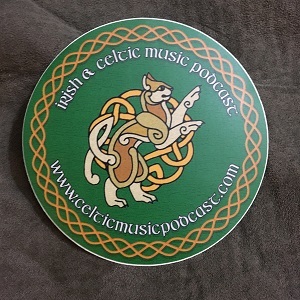 Irish & Celtic Music Podcast celebrates Celtic culture through music. 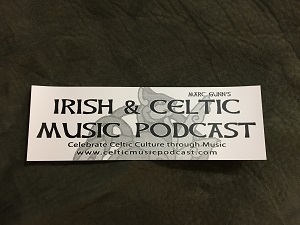 The 2018 T-Shirt from the Irish & Celtic Music Podcast features white Gildan t-shirts and celebrate Celtic culture and music. Get yours while they last. Plus, get a digital copy of Marc Gunn's album Happy Songs of Death. Do you love the Irish & Celtic Music Podcast, but you don't want to pay a monthly donation to the podcast? Or perhaps you want all the cool swag we have to offer in 2018? All money will help me to keep podcasting great music all year long. Thank you! A warm fire glows in the hearth of Celtic culture with this warm compilation CD of Celtic Christmas music. Celebrate the holidays with A Celtic Christmas, featuring a mix of traditional and original songs and tunes about Christmas by indie Celtic bands. All these artists were hand-selected for outstanding music by the award-winning downloadable radio show, the Irish & Celtic Music Podcast. It is the largest Celtic podcast in the world and the #1 promoter of indie Celtic music. Chart-topping Irish Celtic music beyond imagination and set aflame through the inspiration and fusion of past and present Ireland. The tunes on this album are by two of most-popular traditional Celtic groups on the podcast. They are also two of Marc Gunn's very favorite indie Celtic bands–FIMM and Poitin. FIMM is a brilliant all-female quartet Celtic group from Rome, Italy. The music hails from their debut EP “Rose in the Heather” as well as their incredible album “Rooibos & Disappunti”. Poitin is an award-winning Celtic group from the Czech Republic. They dominate the Celtic Radio internet charts with their amazing traditional (and sometimes not-so-traditional) sound. Tunes featured below come from their albums: Poitin, Hot Days, and Bofiguifluki (Celtic Radio Album of the Year 2010). Tracks: Irish Music Set, Spring Frolics, March Flowers, Irish Reels, Paddy's Irish Jigs, Altan Sisters, Doherty's Irish Fire, Head in the Clouds, St. Patrick's Day Polkas , Turlough O'Carolan, Celtic Wedding Reels, Memories of Ireland, Old Irish Woman Set, The Humors of Irish Music. It is truly amazing the amount of GREAT music that is submitted to the Irish and Celtic Music Podcast every day. We’re talking world-class musicians, many of whom don’t get nearly the attention they deserve. That’s why I started creating compilation CDs. I wanted to showcase some of these amazing artists in ways that they might not be able to do on their own. This compilation is a lot like listening to the Irish and Celtic Music Podcast. It features an exciting mix of some of the coolest independent Celtic groups out there. Tracks: Sweeney’s Buttermilk by FIMM, The Whiskey Never Lies by Sligo Rags, The Girls Set by Banshee in the Kitchen, Star of the County Down by Jed Marum with Hugh Morrison and Mason Brown, Hot Days by Poitin, Chi Mi Na Morbheanna/Sleepy Maggie by MacTalla Mor, Almost Irish by Ceann, Considine’s Grove by Anne Roos, Boys Of Tandragee/Tuesday Morning/Checkered Blanket by Athas, Ye Jacobites By Name by Beth Patterson, Loch Lomond by Jesse Ferguson, The Mason’s Apron by Rattle the Boards, Jig Jag by Jamie Laval and Ashley Broder, Rocks of Bawn by Maidens IV, Auld Triangle by Patrick’s Head, Ormond Sound/Liberty Joe’s/Broken by Pitch the Peat, Wild Mountain Thyme by Marc Gunn. Born from the struggle to keep acoustic Irish music alive and relevant, “Victims of Irish Music” gathers the finest independent Celtic musicians who are winning the fight to keep instrumental Irish and Celtic music as vibrant and meaningful as it was when musicians in Ireland were victimized for their love of music. If you are love your Irish heritage, you can show your love of it with this captivating and energizing compilation of amazing music. A portion of the money earned from this compilation benefits the Irish & Celtic Music Podcast. Another portion benefits a non-profit Celtic organization (TBA). But all of it supports the heart of our Irish heritage. Tracks: Cooley's Set (Reels: Cooley's Reel/Sporting Paddy/Toss The Feathers) by Wild Clover Band, Sleeping Under The Tables Set by Kennedy's Kitchen, Lannigan's Ball/Rambling Pitchfork/Tar Road Sligo by Cady Finlayson, Staten Island Hornpipe/Morpeth Rant by The Jolly Rogues, The Gneeveguilla Reel/Drag her Round the Road/The Golden Keyboard by Arabesque, The Boys from Blue Hill/Cherish the Ladies by Bow Triplets, Princess Royale by Thomas “Doc Grauzer, Chicago Trippin up the Stairs by Boston Blackthorne, Rocky Road to Brenham by Celtic Stone, Geordie Lad by Vicki Swan & Jonny Dyer, Old Grey Cat by Marc Gunn & The Dubliners' Tabby Cats, Congress Reel by Poitin, The Road to Lisdonvarna/Morrison's Jig by Vince Conaway, Polkas and Slides by The Tea Merchants, Banks of Spey/High Road to Linton by Highland Fling, Campbell's Farewell to Red Gap/Newcastle by Bedlam Bards, The Skylark/Humours of Tulla/Lucy Campbell's by Culann's Hounds. Experience the best in Celtic Rock! Yes, it’s taken a long time to pick some amazing tracks, mix and match them, and try to have a common theme. I found some brilliant bands in the process. The CD is not yet completely finalized, but I couldn’t help but get the word out now since I hope to have the CD out by St. Patrick’s Day. Tracks: Mordred's Lullaby by Heather Dale, Moore St. Girls by The Elders, In Like Flynn by The Indulgers, Cold Glencoe by Rise, Johnny Jump Up/Swallow Tail Jig by Amadan, Slip Me 5 by Brothers 3, San Patricio Brigade by Black 47, Nothin' by Lenahan, The Grass Is Greener by The Electrics, Day After Day by Tears for Beers, Sovay/Halting March by Paisley Close, My Love Is Like A Red, Red Rose by Rimbo (w/Marc Gunn), The Chieri by Avalon Rising, Alasdair Mhic Cholla Ghasda by RavensWing, Erin Go Bragh by Jayah, The Day We Set Sail by Tale | Theo Niessink, The Great Whale Road by Fathom, A Soulin by Arminta, Groovy Scooby by The Rogues. Subscribe to the Celtic Music Magazine to be notified of each new episode. You'll get Celtic Music News every Thursday. Plus, I'll send you 34 Celtic MP3s for FREE!